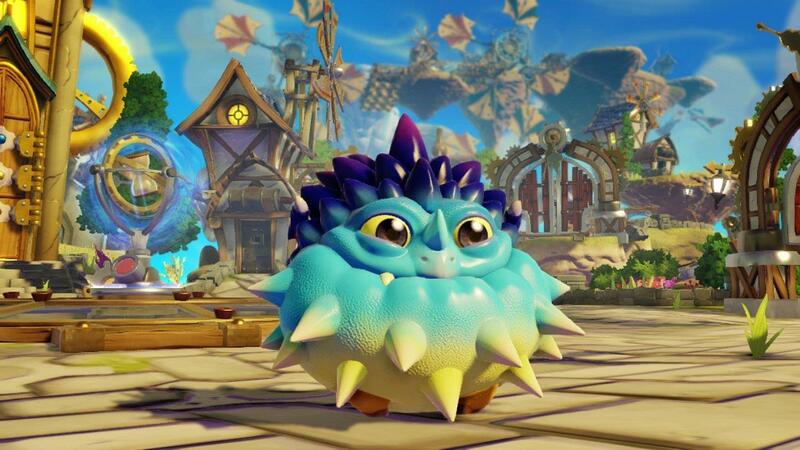 When Skylanders: Swap Force hit retail in mid-October, it was inevitable that there would be new expansion packs coming. We didn’t have to wait long, as both the Fiery Forge Battle Pack and the Tower of Time Adventure Pack came along within a few weeks of launch. While most games in the Xbox 360 and PlayStation 3 console era provide their expansions via digital download, the Skylanders franchise has always made it a physical purchase, due to the allure of the additional figurines for the expansion area, Skylanders, or magical items. In this case, both of these packs follow in the traditional footsteps of the original Skylanders and Giants expansion packs and cost you $24.99 each at retail. 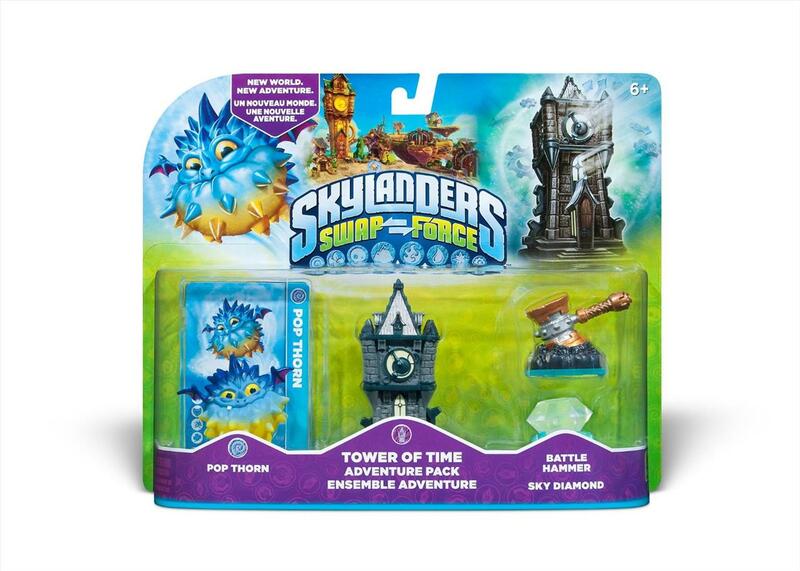 The Tower of Time Adventure (ToT) comes with the Tower of Time figurine, the Pop Thorn (Wind Elemental) Skylander, and the Battle Hammer and Sky Diamond magic powers. In addition to the figurines, the ToT Adventure Pack adds into your in-game inventory the Tower of Time Story Level, the Ring-Out arena Tic Toc Terrace and both virtual magic powers. Out of the four items, only Pop Thorn can be purchased as a separate item from the expansion pack. 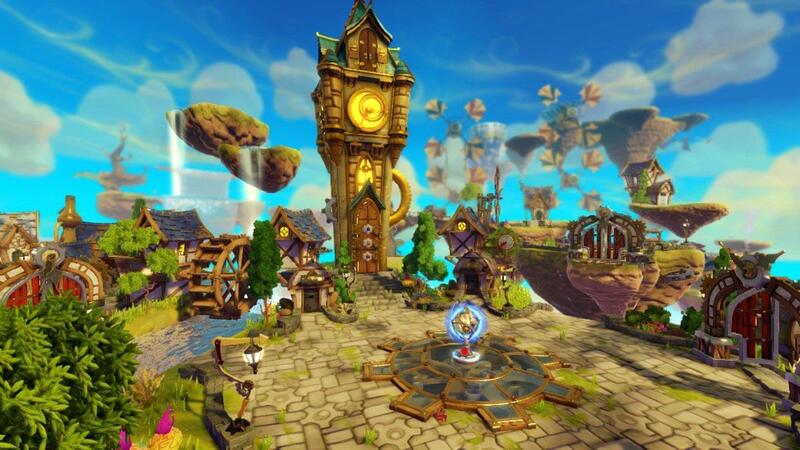 Once you load the Tower of Time figurine onto your portal of power, the in-game tower shows up just off the training yard in the main Skylanders Swap Force setting. This kicks off the storyline which leads to Flynn to getting overly excited and wanting to head in to the clock as soon as possible. 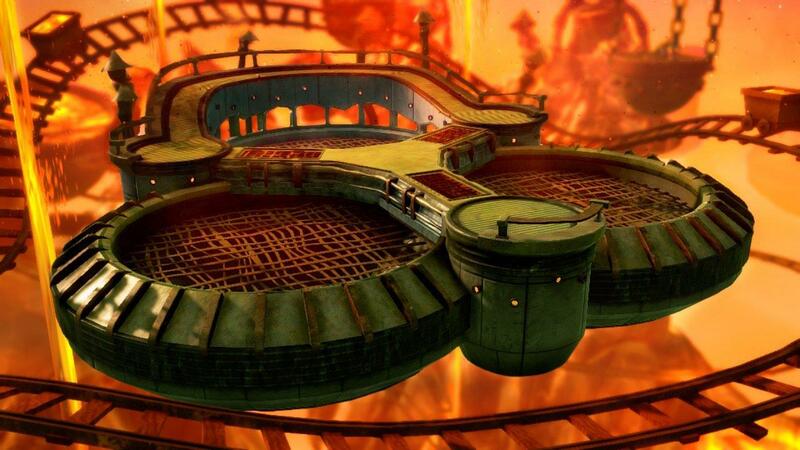 However, Flynn is summoned by the Timekeeper to help the citizens of Clocktown figure out why they have been getting sent into the past for the last several days. With those time travel trips getting more frequent, it is revealed that a Chicken in a Robot Suit named Cluck has messed with the gears that run the Tower of Time and is the villain responsible for all the chaos. 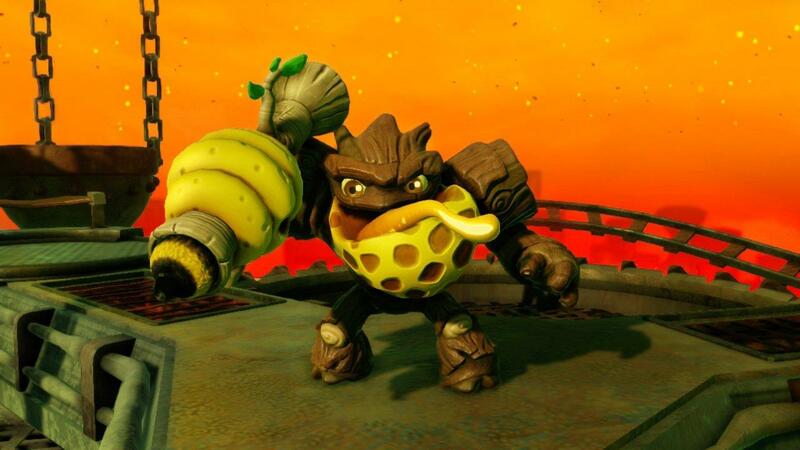 The ToT campaign is broken into five distinct parts, with the retrieval of each of three gears from Cluck’s nests each a level, a mid-campaign boss battle with Cluck (occurs after the second gear is retrieved) and a final Cluck boss battle that reveals his true nature. 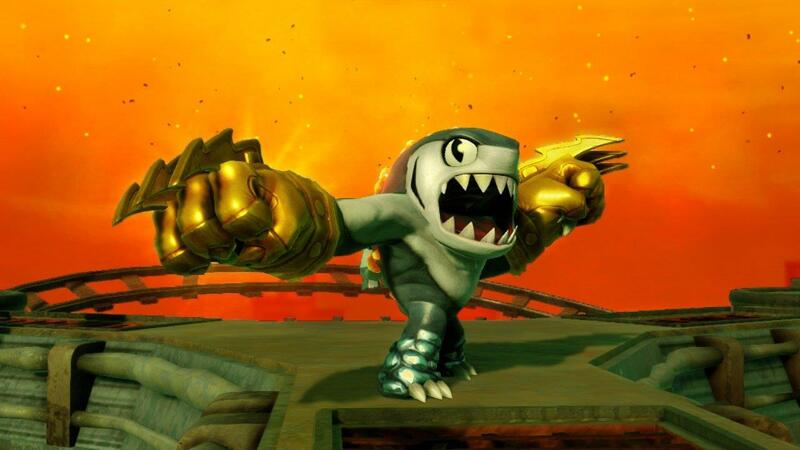 Much like the Swap Force on-disc campaigns, the ToT will require various Skylanders of the different elements, Swap Force combinations, and at least one Giant to complete the entire mission at 100 percent. What it does best is add more quality playing time in the campaign format that we have gotten used to over three games in the series. The only real negative I could find with the Tower of Time expansion is that the camera angles appeared to be a little off from the regular on-disc Swap Force storyline. If you have followed my review of the Original, Giants, and Swap Force games, the camera angles have been a consistent complaint I have had. So for this expansion to have the feeling that it was worse than the main storylines, well, that tells you it was noticeable during gameplay. Other than that, the Tower of Time is a great distraction and probably worth the $25 for the extra Skylander and magic item figurines to add to your collection. Overall, the Tower of Time level is identical in concept and familiar in gameplay to any of the other chapters built into the Swap Force main storyline. 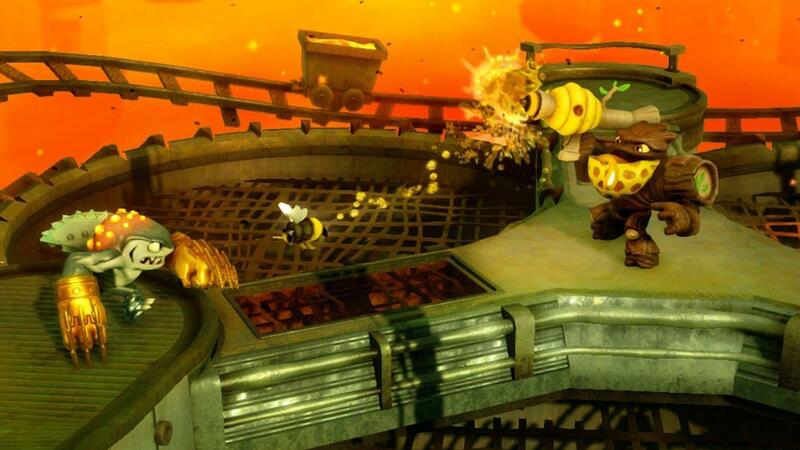 It has the similar challenges, boss battles, hidden areas, usage of different Skylanders with hats, and other rewards. While the $24.99 price may seem a bit steep for just a another chapter, the value in this expansion pack lies in picking up the Tic Toc Ring-Out arena, Pop Thorn and the two magic item figurines. Plus, you can play it on both the 3DS and console versions of the game. So, overall you do get a nice return on your money with all the add-ons across all areas of the Swap Force game. The Fiery Forge Battle Pack (FF) is the pack that had the least amount of interest to me even though it added both a player-vs-player and Ring-Out arena to my inventory. I play the Skylanders series for the fun storylines and campaigns and not for the battle arena play. However, I know there are those out there that enjoy this type of gameplay, so that is where the Fiery Forge comes in. Out of the two packs, the Fiery Forge is probably the one that you may wonder whether it is worth dropping $24.99 on it. 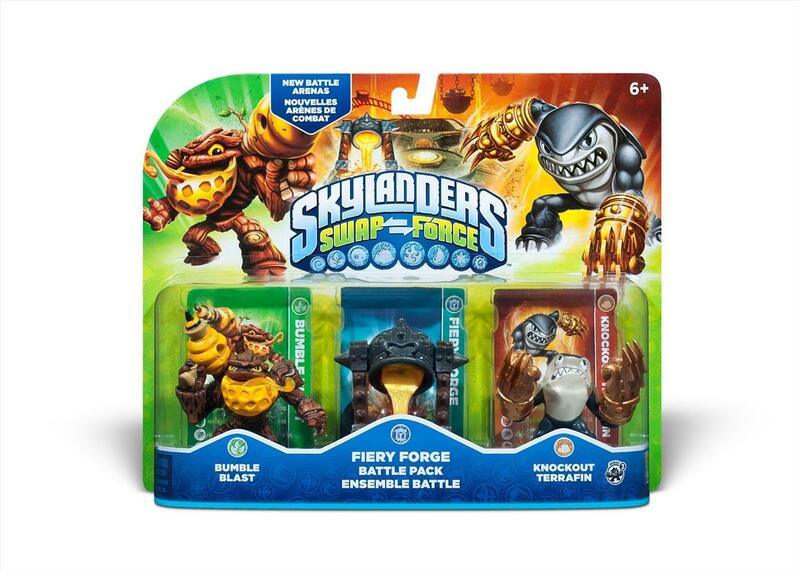 On the surface, this looks like a good value, as you get the Fiery Forge figurine in addition to Bumble Blast (Life Elemental) and Knockout Terrafin (Series 3 Earth Elemental) Skylanders. However, Terrafin is on about his 29th version (I counted at least three different ones I have) and the Fiery Forge only gives you two arenas. Although I am not a huge fan of the arenas, my beef specifically with the Fiery Forge is with the layout. The entire arena is pretty small, with three “main” areas (just grates with no cover in them) and some catwalks you can work around. Although both the PvP and Ring-Out have different hazards (including lava flows and trap doors switches), it still feels like you aren’t getting as much bang for your buck as the Tower of Time. I will say this though: the Battle Forge figurine is a light core, which looks exceptional when it is lit up. Unfortunately, the in-game experience didn’t really match the figurines or the Tower of Terror. But that is from a person that isn’t fond of the arenas, so take it with a grain of salt. Overall, if you do not have any of the figurines in either expansion pack, then dropping $25 on either one isn’t a bad deal. 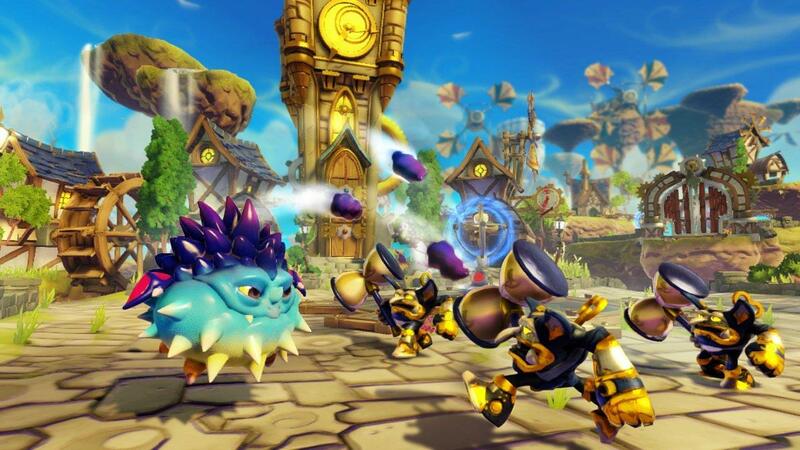 However, depending on your gaming preference, you could focus on either the Tower of Time (campaign) or the Fiery Forge (arena battles) in order to get more of your favorite way to play the Skylanders game. As far as the replayability goes, you are only limited by your enthusiasm for the gameplay itself. However, whichever expansion pack you choose (even if you get both) will provide many hours of additional play and a bunch of new figurines for your collection. Activision has provided two really good options with its Swap Force expansion packs in order to cover players that prefer either the campaign play or arena play (or both) with the Tower of Time and Fiery Forge. Although the price seems a bit high at $24.99 each, the replayability, value of all the figurines, and in-game additions will provide for many more hours of Skylanders Swap Force fun.